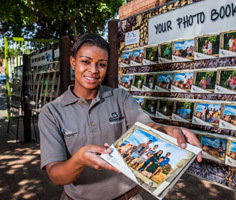 The Happy Snappy Photo Company supplies a souvenir photographic system at a number of popular attractions around South Africa. The Happy Snappy Photo Pack has an excellent performance record and a very active online download and Social Media presence with the visitors visiting, downloading and interacting with their online slideshows and E-stories. 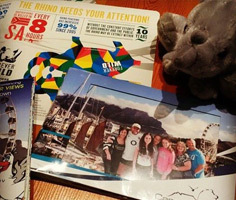 The photo-pack is a glossy folder with specific attraction imagery and contains 2 large photos and 4 postcards. 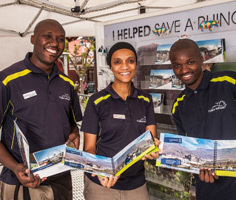 Happy Snappy at the Pretoria Zoo, Table Mountain Cableway and uShaka Marine World supports the Forever Wild Rhino Protection Initiative of Wilderness Foundation Africa through the sale of photo books as well as rhino cut-outs, of which they donate a portion of every rhino value add sold to Wilderness Foundation Africa.